Australian Prime Minister Scott Morrison has defended the mortgage advice industry, calling it a "pretty important service", as the country deals with the fallout from the Royal Commission. 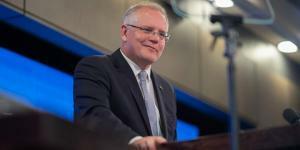 Morrison was pressed on his views about the mortgage broking industry at an event in Australia this week, after the Royal Commission proposed banning commission and suggested a fee-for-service model for borrowers. The recommendations angered the Australian sector, but the Aussie PM has defended the work done by advisers. He said he did not want the sector to "wither on the vine", according to the Sydney Morning Herald. He added: "These are tens of thousands of small and family businesses that help mums and dads get a good deal on their mortgage and so they don't have to just face the banks themselves...It's [a] pretty important service. We want to make sure that Australians can still have access to that service." The Australian government has already moved to ban trail commission from July 2020, and is exploring the potential impact of banning other forms of commission paid by lenders to advisers. The government is also looking at whether a fee-for-service model is plausible and fair. Morrison's comment are likely to encourage the Australian adviser sector which has reacted strongly to the Royal Commission recommendations. The adviser industry, backed by industry body the MFAA, has launched a major advertising campaign against reform. The "Don't Kill Competition" ad campaign is part of a multimillion dollar offensive from the industry to halt radical reform. MFAA CEO Mike Felton believes the Royal Commission recommendations will drive borrowers directly to their bank, reducing consumer choice and hurting competition among the country's lenders.